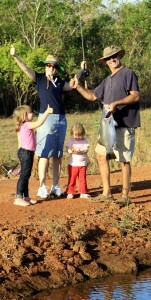 Fishing is fun at the barramundi farm! We recently visited the Flicking Fresh Barra farm off Carveth Rd/Williams Rd on Middle Arm, near Darwin, NT. The turn-off is just past Berry Springs School, which is past the Territory Wildlife Park. The fella running the show is called Adam, he’s a top bloke who will tell you all about aquaculture. Right now fish prices are way down, and that is why Adam is running barra tours. 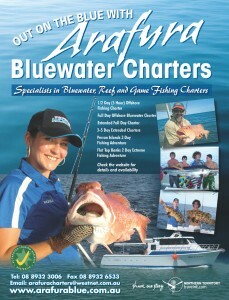 Arafura Bluewater Charters has been operating in Darwin from Cullen Bay for over a decade. 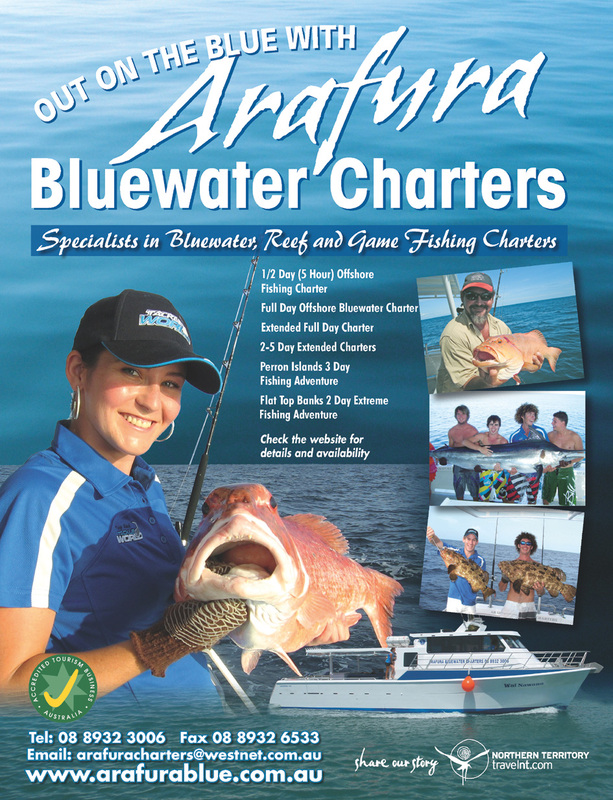 They specialise in bluewater reef and game fishing charters, catering for local, interstate and international fishing enthusiasts on offshore fishing charters. Owner operator Steve Compain has over 26 years experience fishing the NT waters and searched the nation for the perfect bluewater vessel. He uses “Mark Ellis Design” vessels. All vessels are in NT survey, and well maintained and cleaned. Wai Nawana was launched May 2010 … she is a 52′ custom-built Mark Ellis-design vessel built in Fremantle, WA. Tere Tiki is 42′ Precision Randall fishing vessel. Tere Tiki had a full face lift in 2006, including a new 540 hp Cummins. Wai Tui was custom built in July 2006, perfect for NT bluewater fishing. Wai Adi was launched in May 2008, She is a sister ship to Wai Tui, with the addition of an air-conditioner. Arafura’s liveaboard charters offer the ultimate fishing experience in the Top End and have proven successful not only with TV show hosts, but the vast majority of bookings being repeat business with clients booking for the next year and beyond. Liveaboard charters depart at 2000 hrs. Meet the Wai Nawana (outside the lock gates) at the Cullen Bay Ferry Terminal at 1945. Be greeted by Arafura’s friendly crew and stow your gear in their air conditioned accommodation. Then settle in for a few drinks and meet the rest of the group, before getting your head down for the night and wake at the fishing grounds ready for a bacon and egg sandwich a cuppa and some awesome fishing action. The two-day charters are usually to the Peron Islands area, approx 80nm west-south-west of Darwin. The clearer water in this area is home to the red emperor, coral trout, golden snapper, tuskfish, the mighty black jewfish, cod, and also a variety of pelagic fish, including trevally, spanish mackerel, tuna and sailfish. This area has proved popular with several TV fishing personalities, including “I Fish” with Paul Worstling, “Hooked” with Dave Butfeild and Jason Kennedy from “Fishing Trips” has also “Stopped the bus” in these fish rich waters returning regularly on the 2-3 day charters to enjoy a taste of what the territory has to offer. Flat Top Banks and the Tiwi Islands are also possible on the 2 day charters however this is dependent on tides and weather conditions. These charters open up a huge area of remote Territory fishing depending on weather, the time of year and tidal movement. Flat Top Bank nautical miles from Darwin is one option for the neaps (small tidal movement) and is home to huge mangrove jacks, red emperor, tricky snapper, giant trevally, spanish mackerel, with a stop at Cape Fourcroy on Bathurst Island for a session on golden snapper and black jewfish on the way home. One the larger tides Arafura heads past the Peron Islands to the remote fish-rich grounds near Cape Scott, Emu Reef and Cape Ford, again home to red emperor, golden snapper, tricky snapper, jewfish, tuskfish and coral trout, with some trolling thrown in to give the arms a rest, and the chance to tussle with spanish mackerel, or land a trophy sailfish. For the adventurous fisho a long steam through the night some 170nm puts you in international waters. Fishing the remote Tassie, Evans or Flinders shoals, these trips are limited to the calmest times of the year and specific tides. The fishing is world class, with fine table fish in abundance, and awe-inspiring sportsfish. Exotic species like powerful dogtooth tuna, blue trevally and wahoo, all this between the main game, goldband snapper, small and largemouth nannygai, red emperor, longnose emperor, coral trout, coronation trout, trout cod and a myriad of other species. There have been encounters with sailfish and black marlin. Again on the last morning tides permitting a stop at Cape Fourcroy on the way home for a black jewfish if your arms still work. All tackle is provided however if you wish to bring your own gear a minimum of 50lb braid is suggested, a good jigging outfit and some Gulp soft plastics. Fillets can be taken home in the plane in an approved 10kg box. Experience a Territory offshore fishing trip you’ll never forget. Join a half day, full day or an extended fishing charter with an experienced crew who will take you to some of the best fishing spots in the Top End. Destinations include Middle Reef, Fish Reef, Lorna Shoals, Bass Reef and Charles Point. Extended trips go to Bathurst Island, Melville Island and Peron Islands, depending on tides and conditions. The species you will encounter include black jewfish, golden snapper, coral trout, red emperor, spanish mackerel, sailfish and more. Much, much more! Each fishing adventure includes all meals, tackle and bait, soft drinks and water. Equinox can also freeze your fish and box up into airline-approved freight boxes for a flight back home. 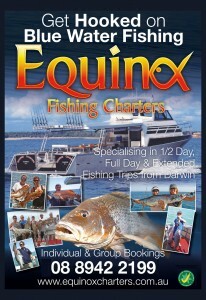 All Equinox Fishing Charter vessels comply with Northern Territory Marine Survey requirements. We only use top quality, locally supplied tackle. Tsar is a 11.5m Stebercraft boat. Licensed to carry 12 passengers with comfortable seating. Toilet facilities on board and a cruising speed of 21 knots. Equinox II is a 17m Millman Maxivision fishing vessel and carries 18-20 people on a one-day fishing trip. The ultimate in deck space and a comfortable ride on any waters. 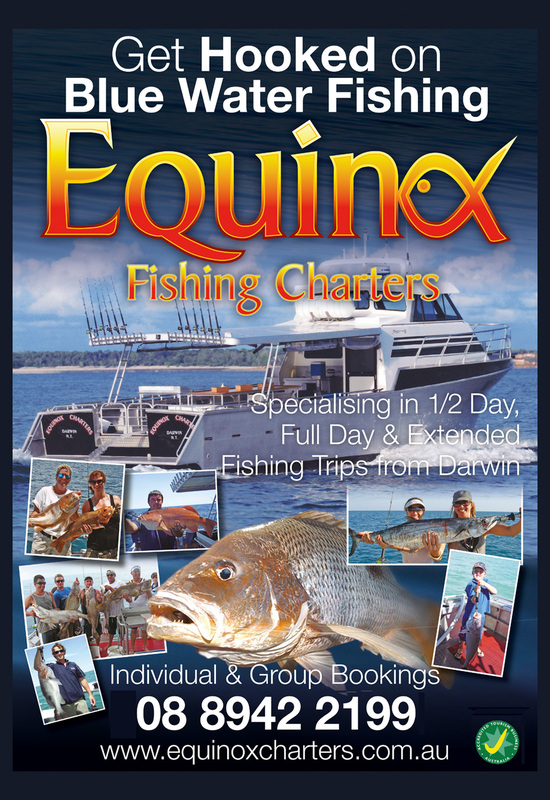 Equinox II is perfect for corporate fishing, small functions, Bucks and Hens days/nights. With the large table and seating you can even hold a meeting/presentation for up to 16 people. Licensed to carry 23 passengers with a crew of 2 for 1C Survey. 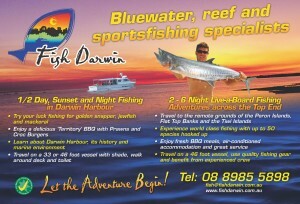 Fish Darwin specialises in reef and pelagic fishing on the exciting bluewater reefs wide of the Top End. This report gives a good idea of what you can expect. Shannon Bubner writes: “After a year of planning, six of my good fishing buddies Swivel, Bingo, Bondy, Arky, Hannan and Rhino from Kimba in South Australia touched down on the Darwin tarmac in the early hours of the September. Anticipation was high and a tackle shop visit was on the agenda. “Topping the shopping list were soft plastics, metal jigs and 80lb braid. “The longest morning in history finally came to an end and it was time to board Northern Exile – our fishing platform for the next four days. “After a 10-hour steam into the night, the anchor was dropped at Caution Point, on the west of Bathurst Island, followed closely by squid baits. “Soon yells of delight and bent rods broke the midnight silence. Within 10 minutes there were six black jewfish slapping the deck. With two kept and four released, it had been a great start. “Sunrise and a new day saw a three-hour steam to Marie Shoal. “Skipper Shaun Uden searched for the best ground – the sounder lit up a couple of times with bait schools and it was time to stretch muscles again. “Three rods with bait, two with metal jigs and two with soft plastics were deployed. Coral trout were caught on the baits and soft plastics, while some savage spanish mackerel action was taking place on the spin reels and metal jigs as we drifted over the shoal. “A few coral trout and mackerel for the icebox and it was time for catch and release fishing, with more than 20 of the 8kg-plus spaniards swimming away. “Some 15 or so species were ticked off the list already. Then another hot session into the sunset with more mackerel, giant trevally, maori sea perch, coral trout and the ever-present sharks – all living to fight another day. “Then we were off to explore Goodrich Bank, north of the Tiwi Islands. Arriving at 10.30pm and seeing the sounder light up like a Christmas tree, it didn’t take long before the sound of screaming drags filled the warm night air. “GTs to 20kg, red bass, longnosed emperor, paddletail and large cod were on the menu, readily taking baits and soft plastics. Some fishos needed sleep! “Sunrise and flat seas welcomed us on our third day. We pulled in some cracker coronation trout, cale cale trevally and longnosed emperor. Red bass to 7kg were testing our stamina. Some cracking red emperor and another mackerel session meant an afternoon rest and cold beer was needed. “Later, we set up billfish baits and soon enough, out of 90m, a huge black marlin trailed our skip bait before slamming it without a hook-up, only to smash a pusher as Swivel was retrieving it. There was yelling and yahooing, but after a 2½ houre battle the line parted. “An early night and it was time to do head back towards Darwin the next morning. We stopped at some snapper ground and soon seven rods were hooked up on goldies of 4kg to 7kg. 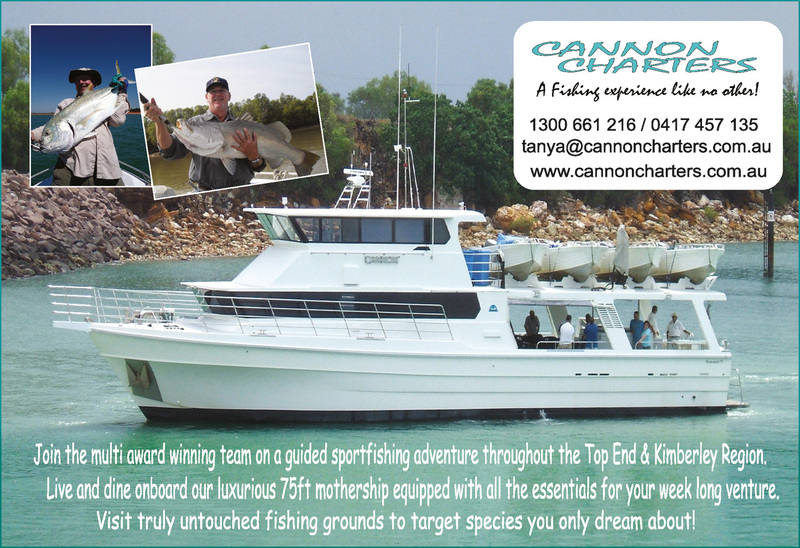 Cannon Charters specialise in mothership fishing adventures across the spectacular Top End. The trips combine fantastic fishing with great scenery and luxury facilities. A holiday aboard the MV Cannon is perfect for corporate bookings, or for those who love an outdoor adventure. 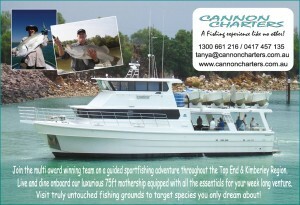 From Darwin, Cannon travels to remote locations to provide guests with rarely fished grounds. There are no supermarkets, motels, restaurants, or clubs where the Cannon goes. There are often no roads in to the coast where Cannon fishes. That’s why the MV Cannon is decked out with everything you could need for your week-long journey. When not relaxing on the mothership, you will be out fishing and exploring in a comfortable dinghy. Travel up narrow creeks, ducking branches or dodging sandbars to access that one spot where you might just find that huge barramundi or threadfin salmon. Return to the mothership for a delicious lunch prepared by an a la carte chef, before heading back into the unknown. Few people get the chance to experience the Cannon secret locations, as most are only accessible by long-range mothership. Cannon Charters has been accredited with the Australian Tourism Accreditation Program since 2006 and is dedicated to providing a high level of customer service. In 2007, Cannon Charters won the Northern Territory Brolga Tourism Award for excellence in the category of Adventure Tourism, and then went on to represent the Northern Territory as a finalist in the 2007 Australian Tourism Awards. Winning a Brolga award is the industry’s highest accolade and the recipients represent the best products and services in the Northern Territory. The MV Cannon is a luxury 75′ mothership built by West Coaster Marine and launched in 2003. She can accommodate eight guests in four cabins, two with twin bunks, with separate toilet rooms. Two cabins have a double and single bed with ensuite. All rooms have individual air conditioning, and there is an endless supply of fresh water. The internal lounge and dining area is a modern leather setting with TV, video, DVD and stereo system, all in air conditioned comfort. The galley is fully stainless steel, with modern conveniences and walk-in cool room. The huge outside entertaining deck area features a three-door drinks fridge with ice-maker, a stainless barbecue, instant boiling water for coffee and tea and a separate shower and toilet. The deck has two large tables that seat eight each under a hard top. There are four sportfishing boats to enable visitors to fish estuaries, rivers and reefs. These boats are powered by Honda BF40s. Each boat has a sounder and Shimano and Loomis gear. If you want to fish Australia’s best run-off rivers in pristine Kakadu National Park, then Darwin’s North Australian Barra Fishing (DNA) is your choice. DNA is a family-owned tourism service that has been operating in Kakadu for many years. It is one of very few operators with a Kakadu licence. Charters are available year-round, with the exception of the wet season from November to late February. The pick of the times to fish Kakadu is from March to May. 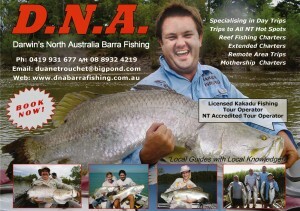 DNA head guide Duane Trouchet said: “Very large rivers flow through the vast Kakadu floodplains. “These rivers are not affected by any agriculture or industry, and the billabongs are still the same as they were hundreds of years ago. “You can see huge prehistoric crocodiles, vast flocks of birds, and all the bait that attracts the barra. These floodplains are huge nurseries, and the food supply attracts big barramundi. “The secret to fishing is the timing, and knowing where to look in the rivers, and when. DNA does day trips as well as extended tours. “As an NT accredited Kakadu Tour Guide, we will pick you up from your accommodation in the Darwin area at approximately 5am (or as arranged ) in our luxury air-conditioned LandCruisers, to take you to your exciting fishing destination,” Duane said. “We arrive at the fishing destination around sunrise. 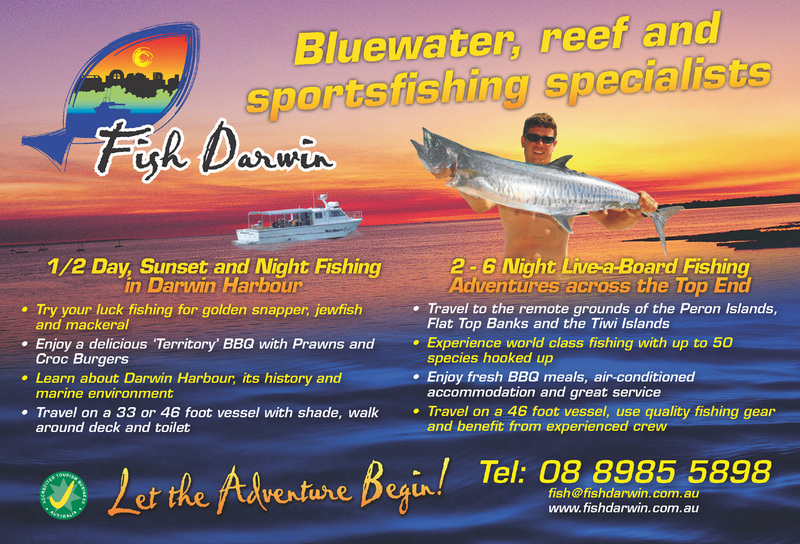 “Enjoy the spectacular Top End wildlife before embarking on our shaded custom-built fishing vessels. “Take on the challenge of fishing in the Top End – you never know what you might hook next, and it could be a 50-pound barramundi. “Enjoy scrumptious barramundi barbecue or cold meat and salad luncheons daily. “Lunch is served on board. We also provide non-alcoholic refreshments and cold water during the day. “You will fish using our G-Loomis rods with Shimano reels and braid lines. “We cater for everyday amateur fishermen, as well as top-level experienced anglers. “We encourage the use of catch-and-release techniques on our tours, but clients may keep fish within legal bag limits. During extended trips, clients stay at luxurious Aurora Kakadu, which has a restaurant, swimming pool, bar and more. On completion of the tour, customers are returned to accommodation in Darwin. Fishing gear is supplied on a replace-if-lost basis. Each boat carries four clients, with a minimum of two per boat, and large groups can be catered for. Deposits of 10 per cent secure a booking. This deposit is non-refundable if a replacement booking can not be found.